I'm trying to catch up on posting my Distress Ink Techniques videos. They have been up on YouTube, it's just here on my blog that I'm behind....I'm so sorry. Here is Distress Ink Techniques Part 3. I would really love hear what you think or if you have questions or suggestions. Wow I am really behind on posting these Distress Ink Technique videos....I am so sorry. 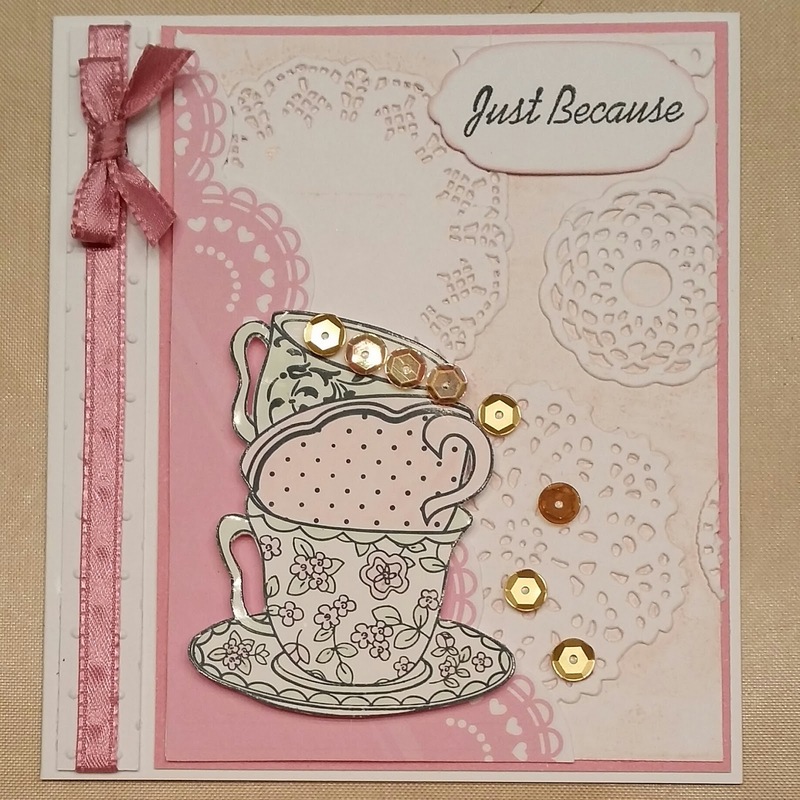 This adorable teacup stamp and doily embossing folder came with the Quick Cards Made Easy magazine back in the June issue and they go together so beautifully. I inked the inside of the embossing folder with "Tattered Rose" Distress ink before embossing the cardstock. That is how I got the effect of the light pink background with white doilies. I will be sharing that technique in "Distress Ink Techniques Part 4" later this month on my YouTube channel jjgz4ever and it will also be on Scrapbook Blessings Club . I had that corner piece that was a leftover scrap and it fit perfectly so I had to use it. 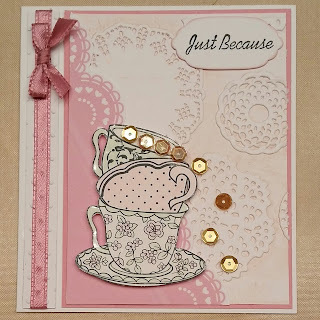 I stamped the teacups on glossy cardstock and colored them with Spectrum Noir markers and then cut them out and used foam tape to adhere them to the card. For fun I added sequins to make it appear that tea is spilling out of the tilted teacup. 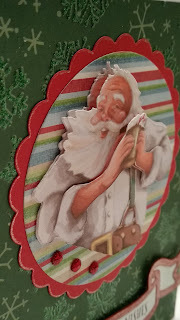 On the side I embossed a strip of white cardstock and attached ribbon and a bow to it and attached that to the card. It all came together perfectly. 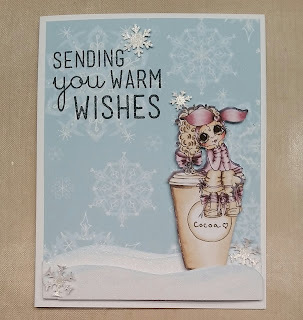 I have been doing a series on Distress Ink Techniques on my YouTube channel and thought I would do a card using Distress Ink. 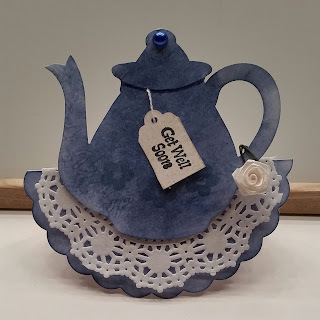 The teapot and rocker card base are made of white card stock colored with "Chipped Sapphire" Distress Ink. Then for a subtle flowered look I stamped some flowers on the teapot using "Weathered Wood" Distress Ink. The teapot is an awesome Sweet Cuts die from Paper Sweeties called Tea For Two . 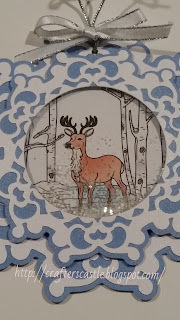 The rocker base was made using a Sizzix Scallop Circle die...I used the largest one which is 4 1/4" and scored and folded at 2 1/8" which is the halfway mark. I added a paper doily to the base and used foam tape to attach the teapot. I also created a "tea bag" tag and stamped Get Well Soon on it. I added a blue pearl to the lid and a flower to the handle. 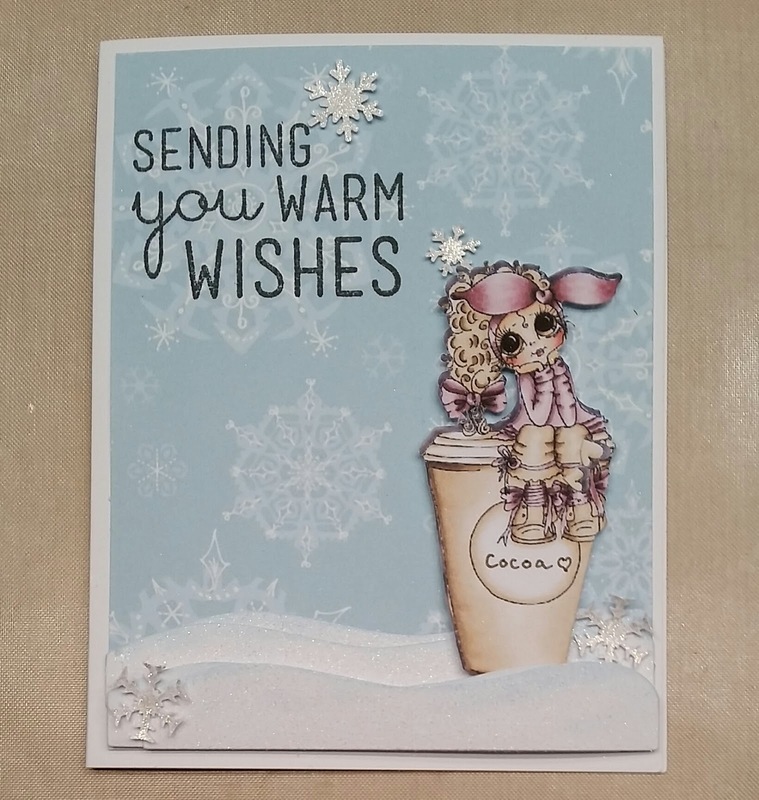 I guess I needed some motivation to make some Christmas cards and a challenge usually does it! I love this Santa Clause with his hot cocoa!!! 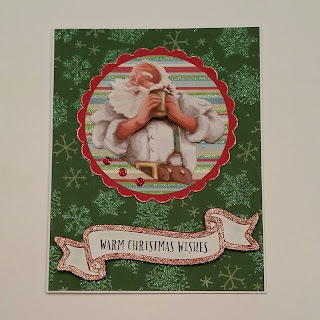 It is off the Cricut Imagine "Santa's Village" cartridge and is 3D. I actually do the layers in such a way that his elbows are back and the cup of cocoa out farther as if he is really holding it. Hi everyone! I'm sad to say that I'm a week behind in sharing my YouTube video series on Distress Ink. There will be 4 parts....one each week in December. Here is Part 1. I will be posting Part 2 later this week. I hope you enjoy them. Let me know what you think by leaving comments, questions, or suggestions on my YouTube channel. This card fold is so cool and so easy!!! 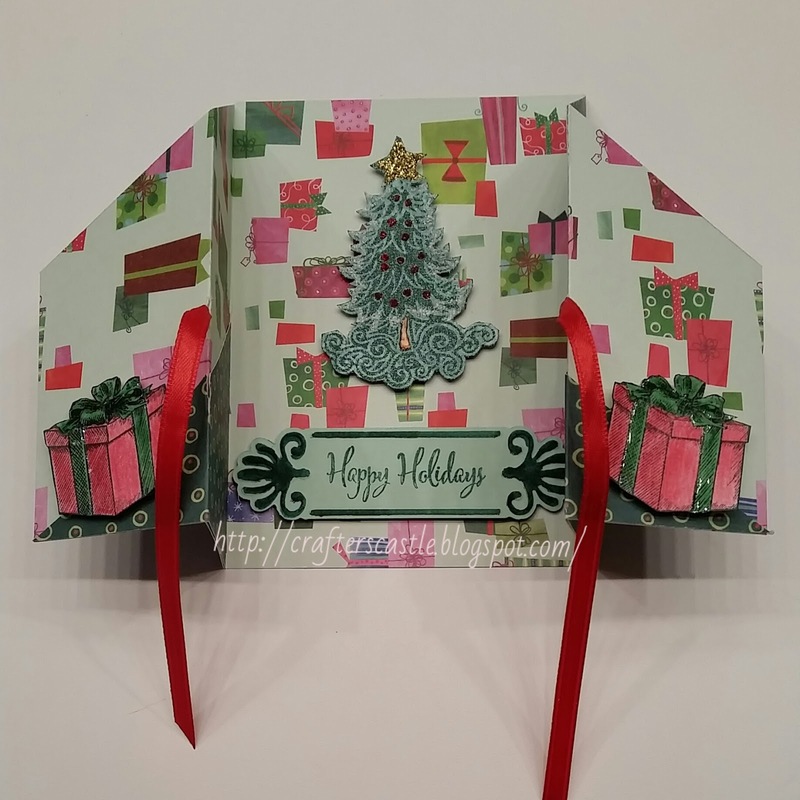 I made a little change....I cut a TINY slit in the front folds on each side to slide ribbon through and tied in the center. To keep the ribbon from coming through the slit I just tied a knot in the end. The tree and the presents were stamped and cut out. I colored presents with colored pencil and used Liquid Glass on the "ribbon and bows". The tree was stamped with White Daisy ink from CTMH and "decorated" with Stickles. For the top 2 pictures I had the card laying down so the light would make the Stickles and Liquid Glass show up. 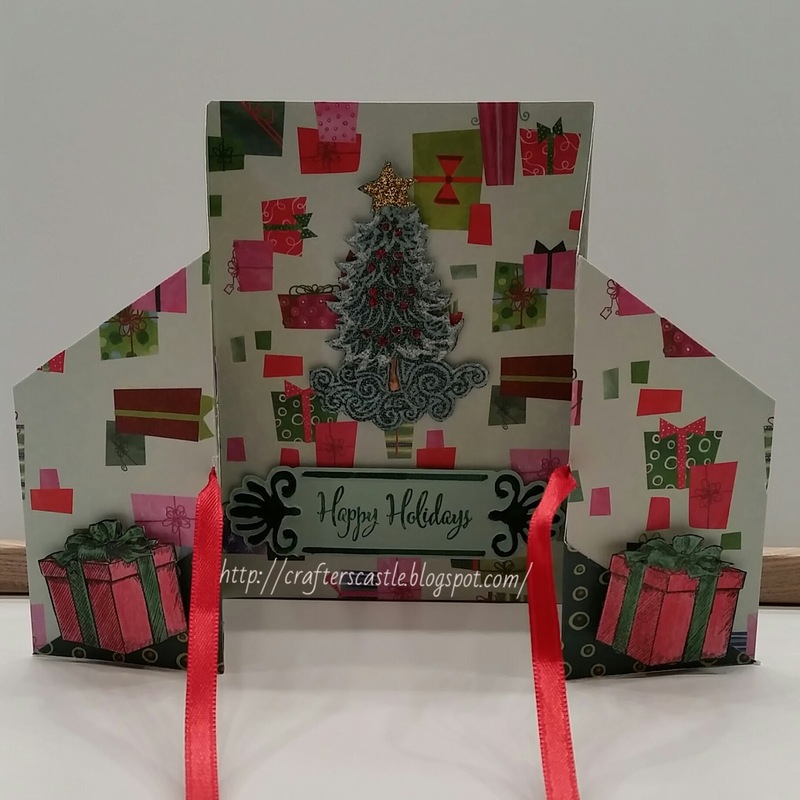 Below is the card open and upright. I hope you like the card and try it yourself. I love My Besties and this one is just as adorable as the rest. 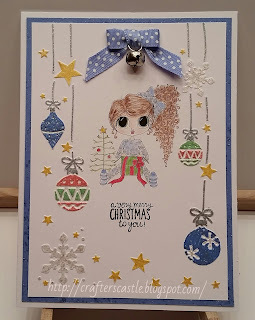 This is "My Besties Christmas Box"
I thought this little Bestie would look cute surrounded by the ornaments of this Darice embossing folder that I used with my Cuttlebug. 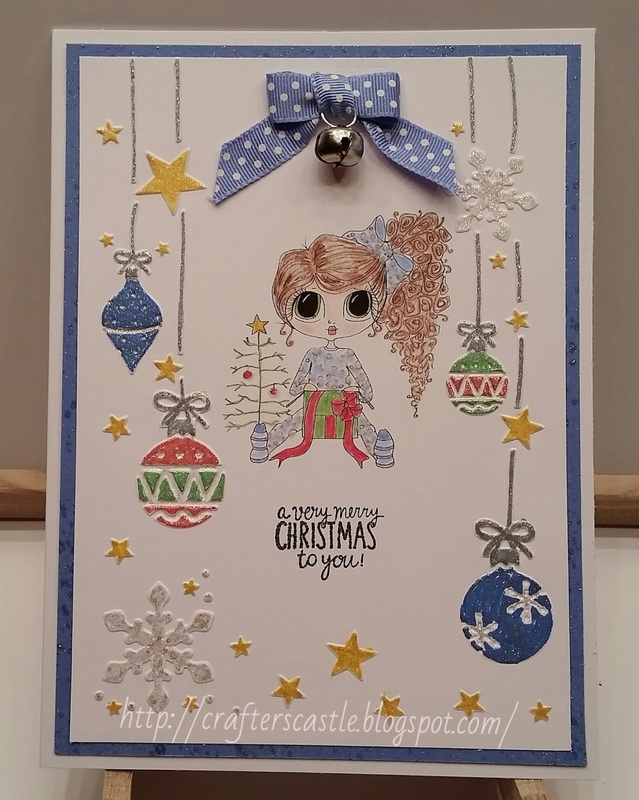 I colored the ornaments, snowflakes, and stars with Sakura Stardust Jelly Roll pens. I colored the Bestie image with colored pencils. 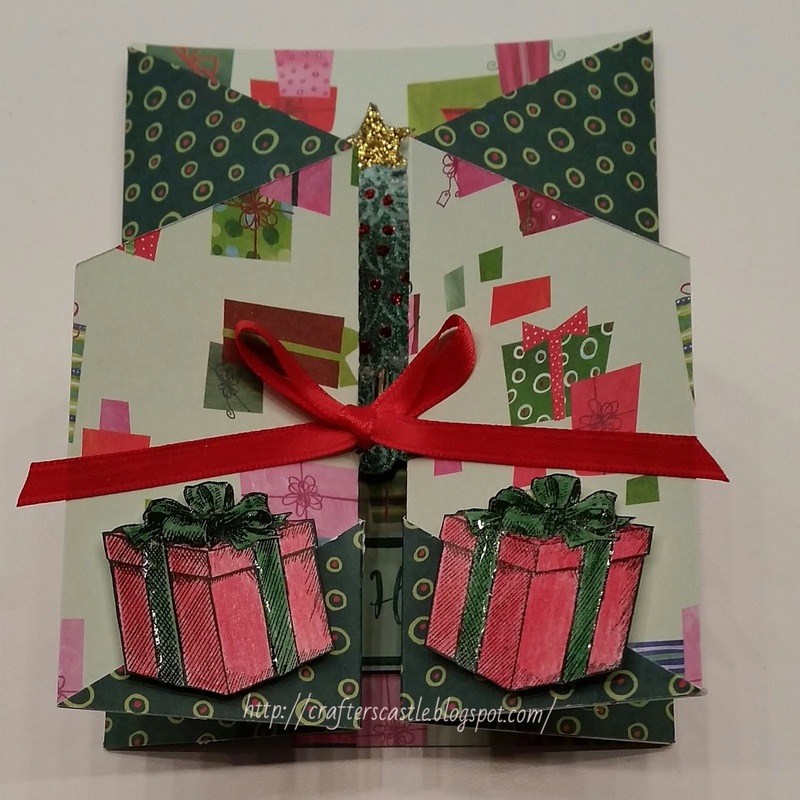 I thought the bow and jingle bell would be the perfect way to finish the card. 3rd Annual Christmas Link Up Party!!! 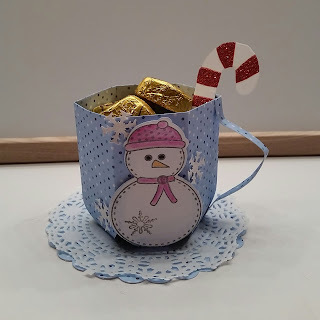 I love making Christmas ornaments and they make nice gifts. 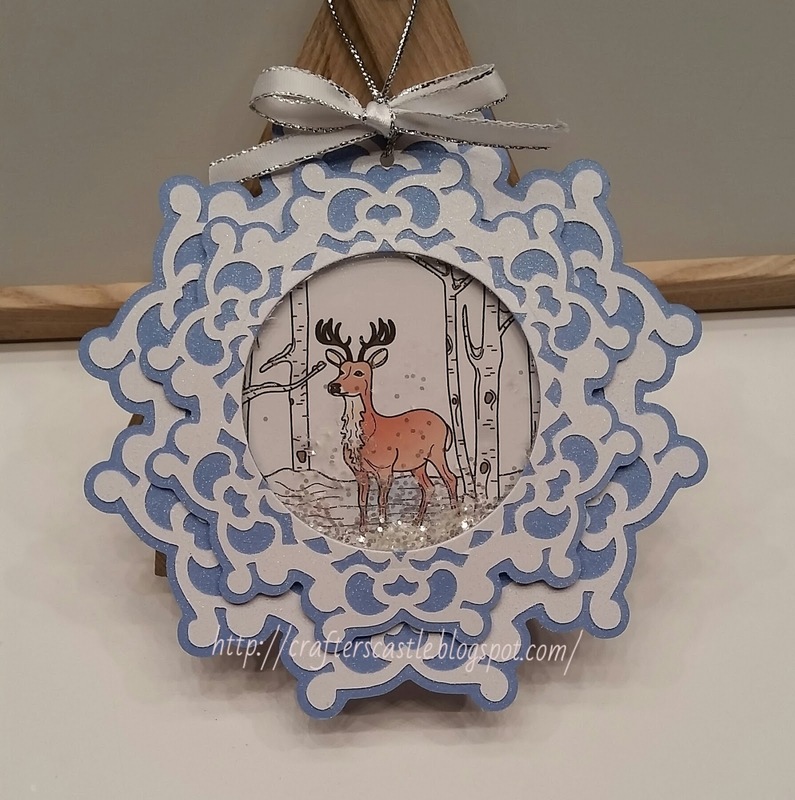 I made this one using one of the Winter Woods images from Deedee's Digis and 2 snowflakes I cut out using my Cricut and the Winter Lace cartridge. The Winter Woods set comes with both colored images and uncolored images. For this I decided to use the colored image so that those of you that don't color can see that what it looks like. I printed it out at 3" high and 3 1/4" wide. Then I cut it out with a 3" Sizzix circle die. I also cut a 3" circle from acetate for the window of the shaker part. The snowflakes were cut at 5" and 4". The 5" snowflake's top layer was cut twice, one for the front and one for the back so that both sides look like a snowflake. 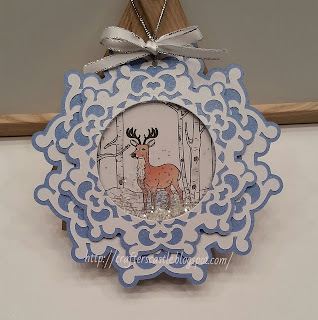 After the layers of the 4" snowflake were glued together I used the 2 1/2" SIzzix circle die to cut the opening in the center. I sprayed the snowflakes with Krylon Glitter Blast Diamond Dust. 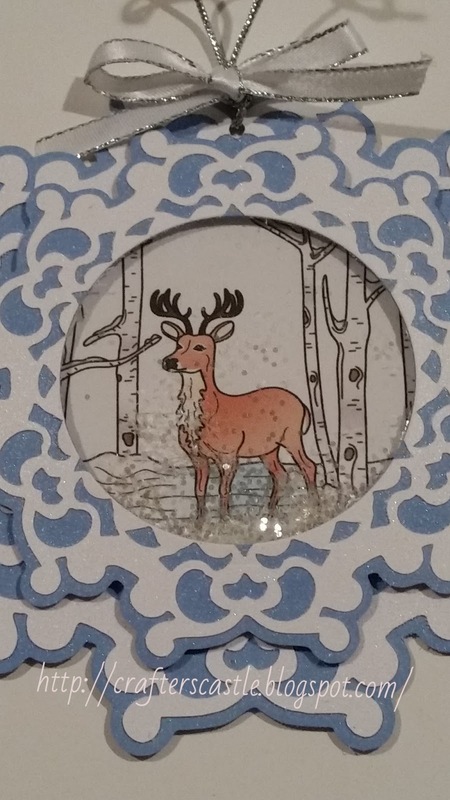 In this case however, in place of the second piece of acetate you will be using the Winter Woods image that you cut out. 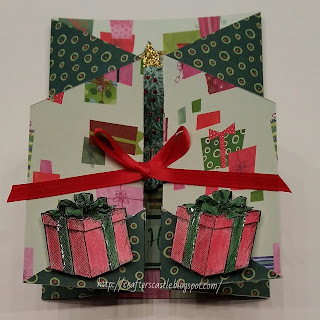 Check out the Scrapbook Blessings Club Christmas Party!